Part elegant decor, part functional piece, this handmade bronze design artfully disguises your garden hose. What do your favorite flowers, veggie garden, and the tree of life have in common? They all need the same thing to grow: water. Store your garden hose artfully with this beautiful handmade piece. A small group of metal artists in Michigan craft the design from sturdy aluminum, inspired by the classic Tree of Life. The included hardware makes hanging the piece outside your home or garage simple and easy. Give the piece to an avid gardener or anyone who enjoys the beauty of the outdoors. Handmade in Whitehall, Michigan. Yes this a great, elegant and practical product. This is a great product that will help organize and help with the appearance of the garden in your home, and keeping your hose in one place and not all over the yard. Also, the design is fantastic you will see how the roots form the base form the tree that is solid and strong like it was over 100 years, and the truck is projected by the branches that reach the outside of the circle with a simple and graceful leafs... This product will provide a more beautiful garden! 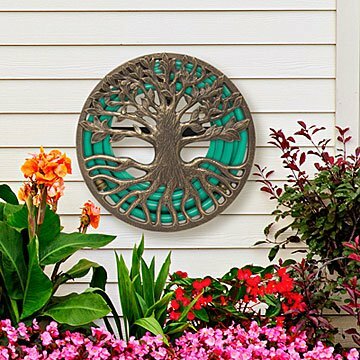 I love the quality and uniqueness of the tree of life hose holder. I love how it looks in my front yard.